I’ve been following photographer Kyle Cassidy for a few years now, from Livejournal to other social media. His wife, Jennifer Summerfield, is a wonderful NY/Philly area actress who also goes by the nom-du-0nline Trillian Stars. Jennifer was recently in a really unique production of Henrik Ibsen’s A DOLL’S HOUSE, and Kyle decided the production needed to be filmed. A Kickstarter was put in place to get the filmed production out there in front of the public. Here, Kyle and I talk about how the production came about, how the play was filmed, and what you can do to take part in this really wonderful project. ANTHONY: You’re in the midst of a successful Kickstarter campaign to create a filmed version of the recent production of A DOLL’S HOUSE performed in the Ebenezer Maxwell Mansion in Philadelphia. First, can you tell us a little bit about the Mansion itself? KYLE: It was built and occupied at almost exactly the time Ibsen’s play is set by a local businessman very similar in economic situation as Torvald and Nora [the protagonists in A Doll’s House] and it’s been preserved as a museum, so all the furniture and things like that are period. Though because it’s an actual building that people have lived in and not a set there are some things that aren’t period — it has, for example, electricity, and this is one of the conceits of having both the play and the video done there — we just accept that the Helmer’s had electricity. There’s also a burglar alarm that’s visible in some of the shots, we camouflaged it, but you can still see it in a couple shots if you know what to look for. So there are a few things, but the wallpaper and the carpets and the drapes and things like that are accurate and were collected by experts over a period of years so it’s the most accurate set you could really hope for. You’re just surrounded by the time period. The mansion’s open for business and they do tours and a few years ago they started doing limited run plays in the space, which is how A Doll’s House happened to be done there. ANTHONY: What is it about the Mansion that made it such a great space to mount a production of A DOLL’S HOUSE, and what makes this particular production so unique? KYLE: The director of the play, Josh Hitchen’s is a very well known actor and director in Philadelphia; he’s famous for doing extremely intimate one-persons shows in small venues that force the audience into the play — he loves claustrophobic environments that delete the stage and put nothing between the audience and the action, so he’d been eyeing the Maxwell mansion ever since he’d first seen it. In many cases it would be difficult to get really great actors to commit to doing a full-length play that was going to run for only five performances because you’re taking a big pay cut — there are only so many audience members you can fit in that space, so you might think an actor would rather do some big play that runs for two months but Josh had an enormous number of connections from actors he’d directed or acted with before and, he had the fact that it was this great play but he also had the mansion to dangle in front of people like a great carrot. So he was able to assemble an incredible cast of very experienced actors that a lot of other people wouldn’t have been able to, partly because of the play but partly also because of where it’s being performed — in a place like this, there is no backstage — every place you go keeps you in character. It turned into one of those things where the director was able to lure a dream team into a dream theater to perform a dream play — it was a perfect storm. ANTHONY: What influenced the decision to film the production after the show’s run ended? KYLE: During the rehearsal process I kept saying to people “you’re taping this right? you’re hiring a film crew and you’re doing a three camera shoot of one of the performances right?” And people were like “that’s a great idea, but we’re really busy making a play.” And I think, the day before the play opened I thought “well, it’s not going to happen if I don’t do it.” So I contacted a video crew, I contacted the mansion and got an OK from them, the mansion was great, they gave me two dates that I could have the run of the place after it was closed to the public, and once I had the green light from them I contacted the actors and the director to see if they’d be able to run the play again and there was this deflating response where I found out that two of the actors were already in other plays and there was no day everybody was able to be there. Initially I was just thinking that it could be shot with three cameras during a regular run and everybody would be out of there in two hours. But with not having certain actors who were in scenes together the entire way in which we had to go about shooting it changed. We were forced to shoot out of sequence and this turned out to be a very great thing; we couldn’t just cover the room with three cameras anymore because not all the actors would be in the rooms together, I thought, well, now there’s no need to just stick in the one room they did the play in. This opened up everything else, and it meant we could put the cameras wherever we wanted, we could do multiple takes, we could shoot the whole thing more like a movie and less like a play. This made it a lot more expensive, a lot more time consuming and a lot more difficult to do, but it also made the final product a lot better. So we shot on two different days with different members of the cast each time. Each day was somewhere between five and ten hours — I can’t remember exactly — but cameraman Brian Siano figured out the breakdown of what scenes to do in what order to keep the actors there the shortest period of time and we went from that master list. Josh Hitchens, the director, had blocked the play, meaning figured out where everybody moved and stood, with the audience in the room in mind and when we got there, we threw a lot of that out the window. And we had to work really, really quickly. We’d figure out what scene was next, bring in all those actors, they’d do a really fast run-through of the scene as it had been staged and while watching this, Brian and I would figure out camera placements or even what room in the house to do it in, and we’d set up the cameras and do another super-fast run though and re-block the scene and the actors would sort of wing it and we’d move along to the next scene. If someone comes over to your house and sits down in the living room with you and talks for 15 minutes, they sit in the same spot. Nobody gets up unless they’re going to get something, but you can’t do that in theater because the audience will get bored, so there’s a lot of movement put into blocking. People sit on a chair for five lines, they get up, they look out the window, they turn around, they sit down somewhere else, that kind of thing, and boring the audience is, in cinema, something you can avoid also by moving the cameras, so we did a lot of that — we could have the actors stay in one spot longer and cut back and forth between different camera angles. ANTHONY: Some of my tech-minded friends will be upset if I don’t ask: what equipment was used to film the production, and what equipment are you using to edit the film into its final form? And why that equipment? KYLE: We were using Panasonic Micro Four Thirds cameras mostly because of the size and the availability of fast, wide lenses. I think we used a 14, a 20, and a 45mm. There were a couple of shots we did with a Nikon d800 and an 85 1.8. The camera kits pack really small. Which was an advantage. We had two tripods only one of which had a video head on it, meaning that it could do smooth camera movements, so one camera was usually fixed and the other followed the action. Not having a lot of gear made things less complicated by not having to worry if we were using the right thing. We had two cameras and four lenses, so all problems had to be solved with two cameras and four lenses. The audio was recorded on a separate device so that we weren’t using the on-camera microphones which would be catastrophic when switching back and forth between microphones in different parts of the room. I’m not exactly sure what Brian’s editing it with, Final Cut or Premiere probably. One thing that the Kickstarter gave me the leisure to do was to hire an editor and not worry about a lot of that — it lets you just find someone who’s good at doing whatever bit of your thing and let them do it and you go on and worry about other stuff. ANTHONY: The original goal of the Kickstarter was a modest $1,400. With 13 days to go, you’ve doubled that. What sorts of stretch goals have you added, both in terms of benefits to the project and added production value to the backers? KYLE: I see all these ridiculously ambitious Kickstarters all the time. You know, someone’s like “I need $25,000 to go to Paris and write a poem at the top of the Eiffel tower” or what have you and they end up not getting funded and it always leaves me thinking how on Earth did you need $25,000 to go to Paris? Are you staying at Versailles? and it turns into an episode of “name that tune” in my head where I’m like “I could do that project for X dollars” — So, what I was looking for initially was pretty much just the amount of money I’d need to pay everyone for what they’d done and have nothing left over and a DVD without a slip case. That’s what I can do this for and not go broke. And really, to me, the only important thing out of the gate was that the play not get lost forever. So after that when we sold more copies I was able to give the cast a bonus and we were able to add a high-definition blu-ray version of the play and the options just get better from there. One thing about physical products like this is that they get cheaper to do the more you get — so right now if we can get to the point where I can print 1,000 copies of the DVD everything gets MUCH cheaper to do, so I can add all sorts of other stuff, I can add more graphics to the package, I can hire a sound designer to do music, I can add more special features, I can go back to the Maxwell mansion and shoot more stuff — the play takes place at Christmas so I’ve been hoping that it will snow and we can rush back and get some footage of the mansion in the snow. We could also re-shoot some scenes outside which would add more depth to the whole thing — the mansion is really beautiful and I think being able to bring the audience outside would be superfantastic. So it’s basically one of those “the more people buy it, the cheaper it gets to make and the more I can do” — so a 4 page booklet becomes an 8 page booklet becomes a 12 page booklet, and so on. ANTHONY: I’m hoping the final 12 days of the campaign will bring in enough money to add that music in and some of those other extras. Last but not least, what is it about Ibsen in general, and A DOLL’S HOUSE in particular, that makes this work so classic and so long-lasting? KYLE: The play is about a woman who undergoes a dramatic change in her perception of the world — she realizes not only that what she’d thought of as a perfect life — and one that from the outside all of her friends thought was perfect — isn’t perfect, but she realizes that the entire basis of society is wrong. She realizes that she’s a person and she’d been living her life as a possession. It was controversial when it came out because so much of the way society in Europe and America functioned was on the idea that women were property and that they had a role and a duty to play and people thought it was just crazy talk that a woman would do things without her husband’s permission. When it was performed Ibsen was forced to write an alternate ending where after giving her great monologue at the end Nora quickly recants — which is as silly as a Bowdlerized version of Romeo and Juliet where they all get up at the end and say “ah, the poison wore off!” and they skip away and Montague and Capulet throw a big bar-b-q for everyone in Verona. A Doll’s House only works if the play challenges, and is allowed to successfully challenge, things that are wrong with the way things are. So I think that gave it a good start; apart from being a very well written play. Another thing that’s kept it alive for so long and held it dearly in people’s hearts is that it’s one of a very few great roles for a woman to play. Theater is littered with plays about men, anybody can list a bunch of iconic roles that can make a male actors career — Hamlet, Stanley Kowalski, Cyrano, Lear, Willy Loman; there are all these great dramatic parts, but so much of theater is about men and the women’s roles in the plays are supporting. Lady Macbeth is a great role as far as Shakespeare’s parts for women, but the play’s called Macbeth, not Lady Macbeth. I think it’s very common for a lot of theaters to do not just one, but many consecutive seasons without a single play that’s about a female character. Plus Nora’s a really complicated individual who goes through a range of emotions that give an actor an opportunity to really show off what they can do. 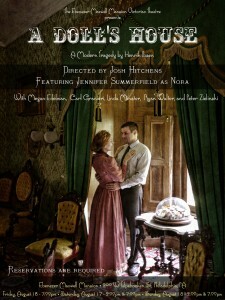 You can still contribute to the A DOLL’S HOUSE Kickstarter. There are 12 days left. Don’t miss out on this. Oh, and if you live in the Philly area, you can also catch Jennifer as another iconic female of the theater — Lady Macbeth — in The Hedgerow Theater’s MACBETH, which runs from now through November 17th. If you go, and get to meet Kyle and Jennifer, tell them Anthony sent you!